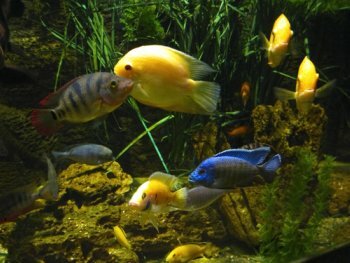 Cichlids (which is pronounced “sick-lids”) are considered by many as being the most intelligent group of freshwater aquarium fish. This is partly because of their strong parental instincts. Most fish is this group care for their young until they are big enough to look after themselves. They are also considered to be intelligent due to way they recognize and respond to their owner. Some Oscar owners have been able to teach their Oscars tricks such as rolling over. I personally always keep some of these fish in my community tank; I currently have two Keyhole Cichlids. I find they react more to me than the other fish. They swim to the glass to greet me when I go near the tank. Although these particular fish have proved to be excellent in my community aquarium, many fish in this group should not be recommended for a community aquarium, particularly Angelfish and Oscars. Species belonging to this group come from Central America, South America, Africa and Asia therefore their water requirements vary greatly. Their body shapes are also influenced by where they come from in the world. There are new species being found all the time. Apart from the new species being found in the wild, breeders have created new hybrid fish, such as the Flowerhorn. The creation of hybrids has caused a lot controversy in the fish keeping community.